Day in, day out at Landford Stone we template, finish and install wonderful worktops, but we also fit incredible natural stone floors! It’s high time we showcased the work of our incredible flooring team who work on both residential and commercial projects to install stunning natural stone underfoot. 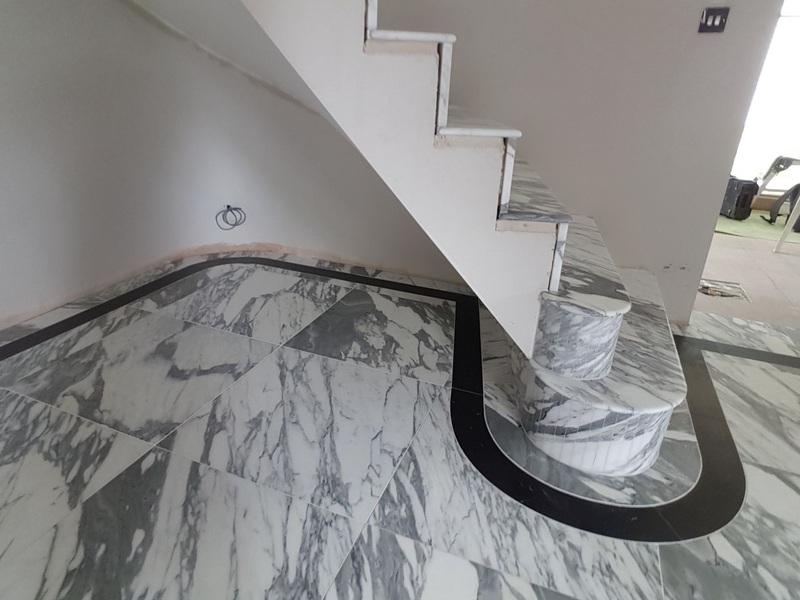 Here is a recent marble floor and curved staircase installed at an impressive property in Chandlers Ford. The marble is Arabescato Corchia (originating from Italy), a white marble with striking grey veins that produces a serious wow-factor look! The individual tiles for the project were pre-cut in Italy from matching slabs, transferred over to their new British home and painstakingly fitted by our expert flooring team. 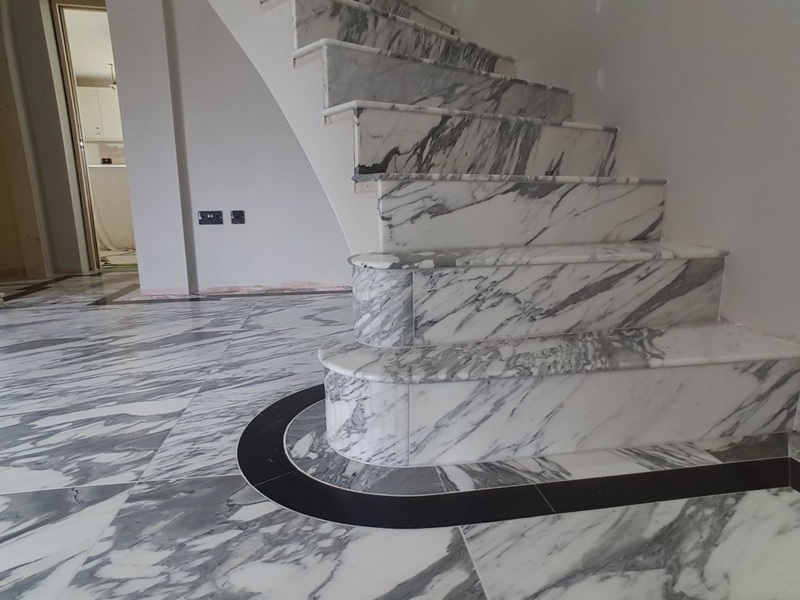 The Arabescato Corchia is complemented by a Nero Marquina marble inset/border (originating from Spain) and the treads and risers were manufactured in our Landford Stone factory. Marble is undeniably one of nature’s most beautiful stones. Marble is a metamorphic rock formed when limestone is subjected to tremendous heat and pressure due to movement in the earth’s crust which brings it closer to the earth’s molten core. In a process of the thermal metamorphism, calcite and other minerals are crystallized to produce a beautifully dense and hard material with a wide range of colours, patterns and veining – the magical marble we all know! Marble as a material is more porous than granite, extremely durable, and well suited for bathrooms, fireplaces and flooring. Marble can also be successfully used for kitchen worktops, provided it is properly sealed and the end user is fully informed of the properties of marble, such as its susceptibility to react with acids. Marble is a winning material when it comes to elegant flooring styles. Marble gives your home a look of prosperity and is certainly an investment with regard to the resale value of your property. Do get in touch with us if you’re thinking about getting marble flooring. A member of our flooring team will be happy to discuss your options.